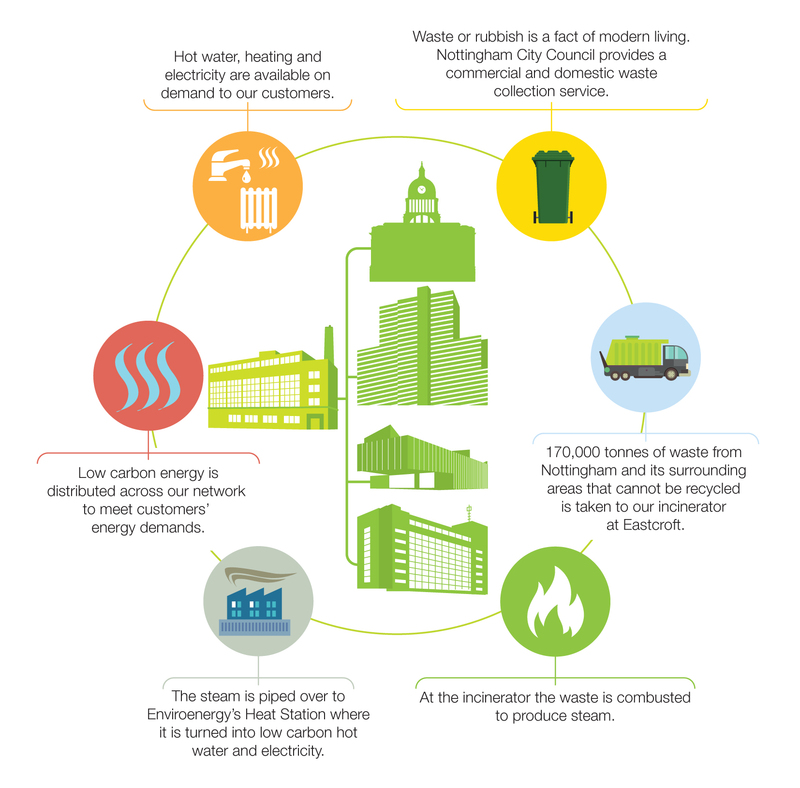 The Nottingham District Energy Scheme provides a low carbon fuel source using energy recovered from waste. Energy-from-Waste (EfW) largely removes the requirement for Nottingham and surrounding Boroughs to landfill refuse, removing the associated emissions. Waste analysis data for the EfW plant indicates that around 61%, by weight, arises from renewable Biomass media. Our heat customers receive a far more efficient energy supply than those with gas boiler systems, only receiving ‘useful energy’. As a Combined Heat and Power (CHP) plant, we integrate production of both usable heat and power (electricity), into one single, highly efficient process. In contrast, the heat produced as a by-product of generating electricity at a traditional power station is mostly wasted. EnviroEnergy participates in STOR and TRIAD avoidance, helping the National Grid meet periods of high demand. The District Energy Scheme offsets approximately 27,000 tonnes of CO² emissions annually that would otherwise be produced by alternative use of gas. The Carbon Emissions Factor (CEF) for heat from the District Heating scheme, as per the latest calculation, is 0.072kg/CO2 per kWh. The CEF for your private wire power is 0.144kg/CO2 per kWh. These figures have been calculated using a formula approved by Adkins, Nottingham City Council and Salix Finance. The Council’s Executive Board adopted a policy on 22 May 2007, requiring 10% of the energy supply (interpreted through carbon emissions) in all new developments over 1,000 square metres, or ten dwellings, to be gained on-site and renewably and/or from a decentralised, renewable or low carbon energy supply. All planning applications to which this requirement applies must be accompanied by an Energy Statement. This is a technical report, written as a supplement to a Design and Access Statement, clearly showing how a development proposal will meet the City Council’s sustainable energy planning requirement. The Statement should include a clearly written executive summary as well as sections recording the energy demand assessment of the proposal and conclusions/commitments.